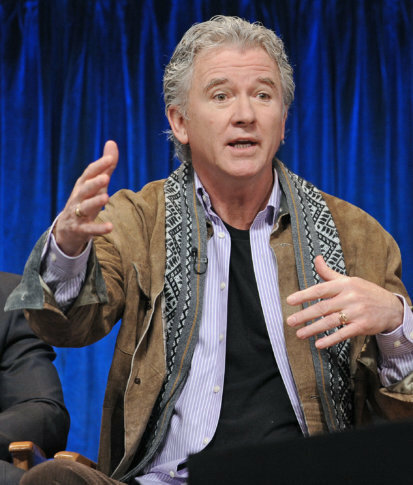 Actor Patrick Duffy turns 70 on March 17. March 17: Singer-songwriter Jim Weatherly is 76. Singer-songwriter John Sebastian of the Lovin’ Spoonful is 75. Percussionist Harold Brown of War is 73. Actor Patrick Duffy is 70. Actor Kurt Russell is 68. Country singer Susie Allanson is 67. Actress Lesley-Anne Down is 65. Country singer Paul Overstreet is 64. Actor Gary Sinise is 64. Actor Christian Clemenson (”CSI: Miami”) is 61. Actor Arye Gross (”Castle”) is 59. Actress Vicki Lewis (”NewsRadio”) is 59. Actor Casey Siemaszko (”NYPD Blue”) is 58. Actor Rob Lowe is 55. Singer Billy Corgan of Smashing Pumpkins is 52. Bassist Van Conner of Screaming Trees is 52. Actor Yanic Truesdale (”Gilmore Girls”) is 50. Bassist Melissa Auf der Maur (Smashing Pumpkins, Hole) is 47. Drummer Caroline Corr of The Corrs is 46. Singer Keifer Thompson of Thompson Square is 46. Actress Marisa Coughlan (”Boston Legal,” “Freddy Got Fingered”) is 45. Rapper Swifty of D12 is 44. Actress Brittany Daniel (”It’s Always Sunny in Philadelphia”) is 43. Singer-TV personality Tamar Braxton (”Braxton Family Values”) is 42. Bassist Geoff Sprung of Old Dominion is 41. TV personality Rob Kardashian (”Keeping Up With the Kardashians”) is 32. Singer Hozier is 29. Actress Eliza Hope Bennett (”Nanny McPhee”) is 27. Actor John Boyega (”Star Wars: The Force Awakens”) is 27. March 18: Composer John Kander (”Chicago”) is 92. Country singer Charley Pride is 85. Country singer Margie Bowes is 78. Actor Kevin Dobson (”Knots Landing”) is 76. Actor Brad Dourif (”Deadwood,” “Lord of the Rings”) is 69. Singer Irene Cara is 60. Keyboardist Karen Grotberg of The Jayhawks is 60. Actor Geoffrey Owens (”The Cosby Show”) is 58. TV personality Mike Rowe (”Dirty Jobs”) is 57. Singer-actress Vanessa Williams (”Desperate Housewives,” “Ugly Betty”) is 56. Keyboardist Scott Saunders of Sons of the Desert is 55. Guitarist Jerry Cantrell of Alice in Chains is 53. Rapper-actress Queen Latifah is 49. Comedian Dane Cook (”Employee of the Month”) is 47. Singer Philip Sweet of Little Big Town is 45. Singers Evan and Jaron Lowenstein of Evan and Jaron are 45. Actress Sutton Foster (”Bunheads”) is 44. Singer Devin Lima (LFO) is 42. Singer Adam Levine of Maroon 5 is 40. Drummer Daren Taylor of Airborne Toxic Event is 39. Actor Adam Pally (”The Mindy Project”) is 37. Actor Cornelius Smith Jr. (”Scandal”) is 37. Actor Duane Henry (”NCIS”) is 34. Actress Julia Goldani Telles (”Bunheads”) is 24. Actor Blake Garrett Rosenthal (”Mom”) is 15. March 19: Actress Renee Taylor (”The Nanny”) is 86. Actress Phyllis Newman (”To Tell the Truth”) is 86. Actress Ursula Andress (”Dr. No,” “Casino Royale”) is 83. Singer Clarence “Frogman” Henry is 82. Singer Ruth Pointer of the Pointer Sisters is 73. Actress Glenn Close is 72. Film producer Harvey Weinstein is 67. Actor Bruce Willis is 64. Actress Mary Scheer (”iCarly,” “MadTV”) is 56. Actor Connor Trinneer (”Star Trek: Enterprise”) is 50. Guitarist-keyboardist Gert Bettens of K’s Choice is 49. Rapper Bun B of UGK is 46. Drummer Zach Lind of Jimmy Eat World is 43. Actress Abby Brammell (”The Unit”) is 40. Actor Craig Lamar Traylor (”Malcolm in the Middle”) is 30. Actor Philip Bolden (”Are We There Yet?”) is 24. March 20: Actor-producer Carl Reiner is 97. Actor Hal Linden is 88. Country singer Don Edwards is 80. Country singer-guitarist Ranger Doug of Riders in the Sky is 73. Blues musician Marcia Ball is 70. Actor William Hurt is 69. Drummer Carl Palmer (Asia; Emerson, Lake and Palmer) is 69. Guitarist Jimmie Vaughan (Fabulous Thunderbirds) is 68. Guitarist Jimmy Seales of Shenandoah is 65. Actress Vanessa Bell Calloway is 62. Director Spike Lee is 62. Actress Theresa Russell is 62. Actress Holly Hunter is 61. Drummer Slim Jim Phantom (Stray Cats) is 58. Model Kathy Ireland is 56. Actor David Thewlis (”Harry Potter and the Prisoner of Azkaban”) is 56. Guitarist Adrian Oxaal of James is 54. Actress Jessica Lundy (”Party of Five,” “Hope and Gloria”) is 53. Actress Liza Snyder (”Yes, Dear”) is 51. Actor Michael Rapaport (”Boston Public”) is 49. Actor Alexander Chaplin (”Spin City”) is 48. Actor Cedric Yarbrough (”Speechless,” “Reno 911!”) is 46. Actress Paula Garces (”Harold and Kumar” films) is 45. Michael Genadry (”Ed”) is 41. Actress Bianca Lawson (”Pretty Little Liars”) is 40. Comedian Mikey Day (”Saturday Night Live”) is 39. Actor Nick Blood (”Marvel’s Agents of S.H.I.E.L.D.”) is 37. Guitarist Nick Wheeler of All-American Rejects is 37. Actress Christy Carlson Romano (”Even Stevens,” “Kim Possible”) is 35. Actress Ruby Rose (”Orange is the New Black”) is 33. Actress Barrett Doss (”Station 19”) is 30. March 21: Actress Kathleen Widdoes (”As the World Turns”) is 80. Singer-keyboardist Rose Stone of Sly and the Family Stone is 74. Actor Timothy Dalton is 73. Singer-guitarist Ray Dorset of Mungo Jerry is 73. Singer Eddie Money is 70. Singer-guitarist Rodger Hodgson (Supertramp) is 69. Bassist Conrad Lozano of Los Lobos is 68. Comedian Brad Hall (”Saturday Night Live”) is 61. Actress Sabrina LeBeauf (”The Cosby Show”) is 61. Actor Gary Oldman is 61. Actress Kassie Depaiva (”Days of Our Lives”) is 58. Actor Matthew Broderick is 57. Actress-comedian Rosie O’Donnell is 57. Actress Cynthia Geary (”Northern Exposure”) is 54. Musician MC Maxim of Prodigy is 52. Keyboardist Jonas “Joker” Berggren of Ace of Base is 52. Guitarist Andrew Copeland of Sister Hazel is 51. DJ Premier of Gang Starr is 50. Actress Laura Allen is 45. Actress Sonequa Martin-Green (”Star Trek: Discovery,” “The Walking Dead”) is 34. Actor Scott Eastwood (”The Longest Ride”) is 33. Actress Jasmin Savoy Brown (”For The People”) is 25. Actor Forrest Wheeler (”Fresh Off The Boat”) is 15. March 22: Composer Stephen Sondheim is 89. Actor William Shatner is 88. Actor M. Emmet Walsh is 84. Singer Jeremy Clyde of Chad and Jeremy is 78. Singer-guitarist George Benson is 76. News anchor Wolf Blitzer is 71. Composer Andrew Lloyd Webber is 71. Actress Fanny Ardant is 70. Sportscaster Bob Costas is 67. Country singer James House is 64. Actress Lena Olin is 64. Singer-actress Stephanie Mills is 62. Actor Matthew Modine is 60. Comedian Keegan-Michael Key of Key and Peele is 48. Actor Will Yun Lee (”Hawaii Five-0”) is 48. Actor Guillermo Diaz (”Scandal”) is 44. Actress Anne Dudek (”Mad Men”) is 44. Actor Cole Hauser (TV’s “Yellowstone”) is 44. Actress Kellie Williams (”Family Matters”) is 43. Actress Reese Witherspoon is 43. Drummer John Otto of Limp Bizkit is 42. Actress Tiffany Dupont (”Murder in the First”) is 38. Rapper Mims is 38. Actress Constance Wu (”Fresh Off The Boat”) is 37. Guitarist Lincoln Parish of Cage The Elephant is 29. March 23: Singer Ric Ocasek (The Cars) is 70. Singer Chaka Khan is 66. Actress Amanda Plummer is 62. Actress Catherine Keener is 60. Actress Hope Davis (”The Matador,” `’About Schmidt”) is 55. Actor Richard Grieco (”21 Jump Street”) is 54. Drummer Kevin Griffin of Yankee Grey is 54. Actress Marin Hinkle (”Two and A Half Men”) is 53. Singer-keyboardist Damon Albarn of Blur is 51. Actor Kelly Perine (”Knight Squad,” `’One on One”) is 50. Drummer John Humphrey of The Nixons is 49. Bandleader Reggie Watts (”The Late Late Show with James Corden”) is 47. Actor Randall Park (”The Interview,” `’Fresh Off The Boat”) is 45. Actress Michelle Monaghan is 43. Actress Keri Russell is 43. Gossip blogger Perez Hilton is 41. Singer Paul Martin of Marshall Dyllon is 41. Actress Nicholle Tom (”The Nanny”) is 41. Country singer Brett Young is 38.